Heart-warming, "Home Sweet Home" and Morning Glory Sampler. 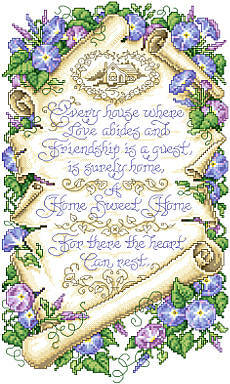 Sandy Orton brightens the day and the home with this parchment-like sampler in Counted Cross-Stitch. This verse and design by the artist, reads "Every house where love abides and Friendship is a guest, is surely home, A Home Sweet Home. For there the heart can rest". Contents: Stitch Count 112w X 189h. Finished size on 14-count 8" X 13-1/2"